The famous mathematician John Louis von Neumann (1903-1957) was born in a prosperous Jewish family in Budapest, Austro-Hungarian Empire, as János Lajos von Neumann. A child-prodigy, János received his Ph.D. in mathematics from Pázmány Péter University in Budapest at the age of 22, simultaneously earning a diploma in chemical engineering from the ETH Zurich in Switzerland. Between 1926 and 1930, he taught as a Privatdozent at the University of Berlin, the youngest in its history. By age 25, he had already published a dozen of major papers. John von Neumann emigrated to the United States just in time—in 1930, where he was invited to Princeton University, and, subsequently, was one of the first four people selected for the faculty of the Institute for Advanced Study (two of the others being Albert Einstein and Kurt Gödel! ), where he remained a mathematics professor from its formation in 1933 until his death. Von Neumann was an important figure in computer science. In 1945, while consulting for the Moore School of Electrical Engineering on the EDVAC project, von Neumann wrote an incomplete set of notes, titled the First Draft of a Report on the EDVAC. 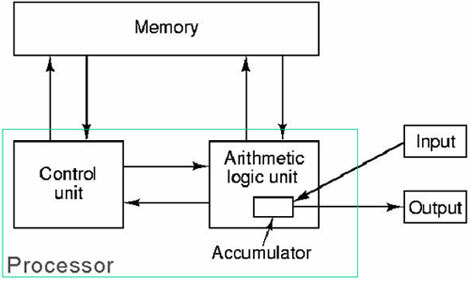 This widely distributed paper laid foundations of a computer architecture in which the data and the program are both stored in the computer's memory in the same address space, which will be described later as von Neumann Architecture (see the lower drawing). This architecture became the de facto standard for a long time and is still used today (until technology enabled more advanced architectures). Von Neumann also created the field of cellular automata without the aid of computers, constructing the first self-replicating automata with pencil and graph paper. The concept of a universal constructor was fleshed out in his posthumous work Theory of Self Reproducing Automata (based on lectures, delivered at several universities in 1948). He described what came to be known as the von Neumann Universal Constructor, a self-replicating machine in a cellular automata environment. He also proved that the most effective way of performing large-scale mining operations such as mining an entire planet or asteroid belt would be by using self-replicating machines, taking advantage of their exponential growth. 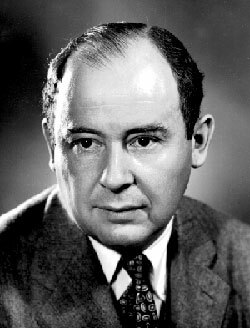 Von Neumann is credited with at least one contribution to the study of algorithms. The renowned computer scientist Donald Knuth cites von Neumann as the inventor (in 1945), of the merge sort algorithm, in which the first and second halves of an array are each sorted recursively and then merged together. His algorithm for simulating a fair coin with a biased coin is used in the software whitening stage of some hardware random number generators. In 1956 von Neumann wrote his (posthumously published) book The Computer and the Brain, in which discusses how the brain can be viewed as a computing machine. The book is speculative in nature, but discusses several important differences between brains and computers of his day (such as processing speed and parallelism), as well as suggesting directions for future research. Memory is one of the central themes in his book.